FREMONT, Calif. /California Newswire/ — EGW Publishing, established 1979, is proud to announce the release of its newest book, “Poets About Poetry: Interviews with Contemporary American Poets” by H. Philip Hsieh. 14 renowned poets, including four Poets Laureate of the United States, a Nobel Prize winner (chemistry), three Pulitzer Prize Winners and other prestigious poetry award recipients are presented in this book of interviews. The author, H. Philip Hsieh, is the editor-in-chief of a new poetry journal “Nourish-poetry & haiku” (www.nourish.com). He is also a member of the editorial committee of New World Poetry Bimonthly in the U.S., and has published two poetry-related books. Also an accomplished Chinese calligrapher, Dr. Hsieh extensively explores the interplay between poetry and calligraphy in his work. “Poets About Poetry” is an exceptional volume for both poets and poetry readers alike. 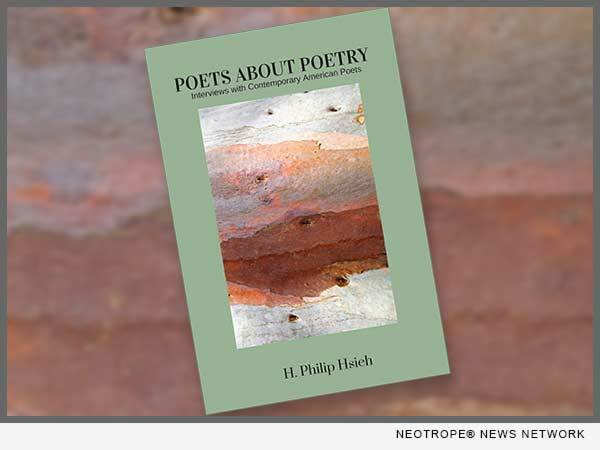 H. Philip Hsieh’s new book explores the art and craft of poetry from the viewpoint of 14 distinguished poets. These poets vary in their backgrounds and in the ethnic groups they come from; they speak a rich mosaic of American experiences in the twenty first century. These conversations provide insightful wisdom on a wide range of topics including haiku, poetry with music and dance, the Beat Movement, minority experiences, poetry slam, the use of metaphors, challenges in translating poetry, inspiring poets or mentors, the use of memory in poetry and various other issues related to the writing process. Lawrence Ferlinghetti has published numerous books on poetry, and has received the Robert Frost Memorial Medal, the Author’s Guild Lifetime Achievement Award and the National Book Critics Circle Award. He co-founded the famous City Lights Booksellers and Publishers. Maxine Kumin’s poetry won her many awards including American Academy & Institute of Arts & Letters Award & the Pulitzer Prize in Poetry in 1973. She was appointed the Poet Laureate of the United States 1981. Jerry Ball writes poems both in the metered format and in free verse, including more than ten published books of poetry and haiku. Dr. William W. Marr is regarded as one of the leading contemporary Chinese-language poets, and served as the President of the Illinois State Poetry Society in 1993-1995. He has published four poetry collections in English. Dr. Roald Hoffmann, one of the two winners of the 1981 Nobel Prize in Chemistry, is the Frank H.T. Rhodes Professor of Humane Letters Emeritus, and has published six poetry collections. Ted Kooser was the Poet Laureate of the United States from 2004 to 2006, and has published twelve collections of poetry, and was awarded the 2005 Pulitzer Prize in Poetry. Nikki Giovanni has written close to twenty volumes of poetry, and is the recipient of over twenty honorary doctorates and numerous awards. Mr. Juan Felipe Herrera was elected a Chancellor of the Academy of American Poets and appointed to be Poet Laureate of California. In both 2015 and 2016, he was named Poet Laureate of the United States. Christopher Herold, together with Alex Benedict, founded The Heron’s Nest and served as its 1st editor-in-chief. The magazine has become one of the leading English haiku magazines. He has published six volumes of haiku selections. Joy Harjo has published fifteen poetry collections. The Wallace Stevens Award is among the many awards she received in Poetry. Naomi Shahib Nye has published ten poetry collections. She has received four Pushcart Prizes and the Paterson Poetry Prize. In 2009, she was elected a Chancellor of the Academy of American Poets. Rita Dove was appointed Poet Laureate of the United States in 1993 and 1994. She was also awarded the Pulitzer Prize for Poetry in 1987 and received the National Medal of Arts in 2011. She was elected a Chancellor of the Academy of American Poets in 2006 and is an advisory editor to many literary periodicals. Jane Hirshfield has written nine collections of poetry. Her honors include The Poetry Center Book Award. She was elected a Chancellor of the Academy of American Poets in 2012. Li-Young Lee is the author of four poetry collections, and has received such honors as the William Carlos Williams Award, Lamont Poetry Selection, and Lannan Literary Award. The book is available through Amazon, and the e-book version is available for Kindle.